If you can do gravity, you can do electrostatics. They are both inverse square laws for non-uniform fields and behave similarly for uniform fields too. This post follows on from this earlier one which introduced Newton’s Universal Law of Gravitation. 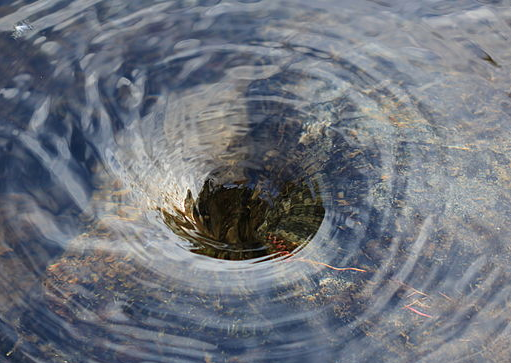 An object with mass creates a gravitational field around it sucking mass towards it – like a whirlpool. Imagine a paper boat. It will always be pulled towards the centre of the hole. On earth g = 9.81Nkg-1 (acc due to gravity). Slightly variable, equatorial r >polar r, thus g greater at the poles, neglecting the spin of the earth which will tend to reduce effective value. g = constant near the Earth’s surface, falls as as we move away. Simple ideas to begin with. If this is large enough, the body starts to slide down the slope The green vector, R is the NORMAL REACTION. This is numerically equal to Wcosθ but always acts AWAY FROM A SURFACE. It is an electrostatic force since if two bodies are touching, their electron clouds overlap a little bit and charges in both bodies are pushed apart. The charges tend to resist being separated hence exert a force to prevent this happening. Weight is of course, gravitational, so these two forces are NOT Newtonian pairs. The pull of the Earth on the Moon (and vice-versa) is an example of a Newtonian pair. Here’s a link to this idea used in practice-finding the acceleration of a body down an inclined plane. You should be able to think of at least four vector quantities (size plus direction) and four scalar quantities (size only). If you can’t, look here. You can’t just add numerically when you want to add two or more vectors (of the same kind, obviously) since a push of 1N to the left when added to a pull of 3.5N to the right results in a pull of 2.5N to the right. We have to take direction into account. But, what if they don’t act along the same straight line? There are several methods for adding lots of them together. The head-to-tail method is one. A vector is just a line on a piece of paper of a particular length which represents its size with an arrow on it to indicate direction. Adding two vectors A and B is quite simple. Take the tail of B and put it on the head of A. The vector sum is found by the line joining the tail of A and the head of B. Works for as many vectors as you like. In more detail, the head-to-tail method involves drawing a vector to scale on a sheet of paper beginning at a designated starting position. Where the head of this first vector ends, the tail of the second vector begins (thus, head-to-tail method). The process is repeated for all vectors that are being added. Once all the vectors have been added head-to-tail, the resultant is then drawn from the tail of the first vector to the head of the last vector; i.e., from start to finish. Once the resultant is drawn, its length can be measured and converted to real units using the given scale. The direction of the resultant can be determined by using a protractor and measuring its angle of rotation – in my example anticlockwise from due East, but clockwise from North can also be used. Just specify. A step-by-step method for applying the head-to-tail method to determine the sum of two or more vectors is given below. Choose a scale and indicate it on a sheet of paper. The best choice of scale is one that will result in a diagram that is as large as possible, yet fits on the sheet of paper. 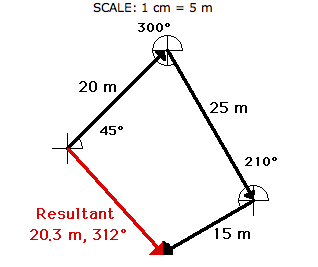 Pick a starting location and draw the first vector to scale in the indicated direction using a ruler and protractor. Label the magnitude and direction of the scale on the diagram (e.g., SCALE: 1 cm = 20N for adding forces, for example). 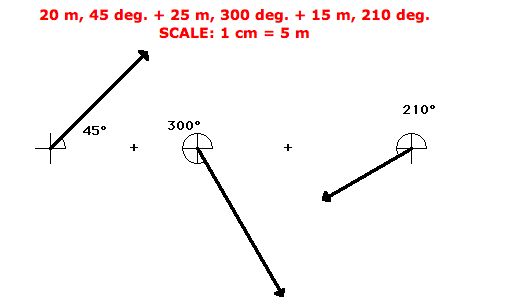 Starting from where the head of the first vector ends, draw the second vector to scale in the indicated direction. Label the magnitude and direction of this vector on the diagram. Repeat steps 2 and 3 for all vectors that are to be added. Draw the resultant from the tail of the first vector to the head of the last vector. Label this vector as Resultant or simply R.
In your MYP or IG course you should have been told to use a sharp pencil to draw a small cross to represent a data point on a graph, or a dot with a ring round it. The diameter of the ring should represent the error in the reading. In IB, we do things more precisely. Error bars show the actual uncertainty above and below the data point. They can be errors in either the dependent x or the independent y variable or both. In the following example we’ll only concern ourselves with an uncertainty in y.